I’ve been riding a review copy of the Schlitter Encore recently, along with the Optima High Baron which carried me to a 7th place finish at this year’s Tour o’ the Borders. To complete a nice side-by-side performance test I borrowed the demo M5 Carbon Highracer from Laid Back Bikes in Edinburgh – brief side by side comparison here. The test protocol was simple – go to the promenade and ride up and down beside the sea (nice and flat) holding a given power for the whole of a lap without touching the brakes, then see how fast I went on each bike. I varied as little as possible between the bikes, including using the same wheels (where possible) and power meter etc. I also tried for the calmest conditions in terms of wind, although naturally in Edinburgh it was impossible to find a calm day. Just a note – it would be much better to perform virtual elevation calculations for each bike. I think there is a good bit of error in the testing described below, but I just can’t find a convenient route that doesn’t require use of the brakes (compounded by living in the world’s windiest place… it’s a hassle!). Until someone produces a proper calculation, we make do with cruising beside the sea in the sunshine… I suggest that these results are taken as indicative only, though for what it’s worth I do feel that the ordering matches my gut feel of how each bike rides. 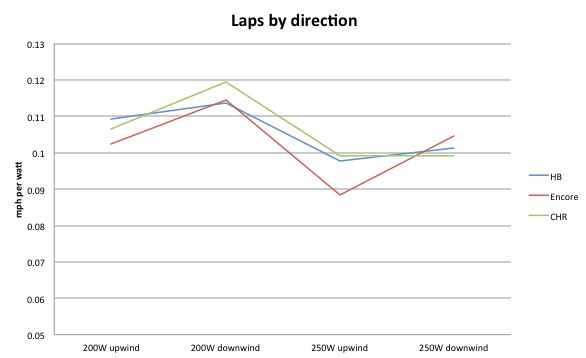 It turned out to be a little tricky to get exactly the target wattage for each run, so first of all here is a graph of speed per watt for each bike (all laps of both directions averaged) to give a comparable ranking of “bang for your buck”. As you would expect, while you go faster at 250W than 200W, higher power gives diminishing returns due to the exponential increase in wind resistance, so the high power runs (plotted in red) show less speed per watt than the lower power runs (plotted in blue). TL;DR – the CHR is a shop demo and not optimised for naked speed, the Encore is a new-to-me review bike and I haven’t spent a lot of time tweaking it, while the High Baron has been mine for three years and I’m very comfortable on it! – I’m not tall enough to ride the CHR with my power chainset (170mm) so I was using a PowerTap wheel and plain 155mm cranks instead. The PowerTap reads 1-2W higher based on testing conducted with both meters fitted on a turbo trainer (so this slightly disadvantages the CHR, by about half of one percent – down in the noise of wind gusts unfortunately). – I used the same 32 spoke 3-cross Archetype wheelset with 28mm Schwalbe Ultremo tyres on the Encore and High Baron, but the M5 CHR doesn’t have enough clearance, so I had to use the provided Shimano R500 front with Schwalbe Durano Plus tyres (faster wheels but slower tyres on the CHR). – The Archetype wheelset has a Shutter Precision hub dynamo on the front, the R500 does not. (The lights were off, but there is still a small amount of extra friction, amounting to the equivalent of a couple of feet per mile extra gradient). – I used a Radical Aero seatbag on all three bikes, but on the CHR I used the stock bag from Laid-Back-Bikes which still has the fabric bottle holder on the side – I cut this off on my own Aero seatbag. – I didn’t have a mirror fitted on the Baron or Encore but had a small mirror fitted on the CHR, although I turned it parallel to the wind for the test. – Both the M5 CHR and High Baron are running dropped chains, but the CHR has a bit of chain tube to make it more useful as a shop demo, which will add some (an unknown amount of) friction to further disadvantage the CHR. Refer to the posts linked in the first two paragraphs for photos of all three bikes (I’m afraid I’m still working on formal reviews of the M5 CHR and Encore, so don’t have comparable shots of them to stick in a rollover). My High Baron is as reclined as the frame will allow, but the M5 CHR can go flatter with a bit of modification to fit a lower seat pillar, as can the Encore (to a lesser extent – the seat back was closer to the max recline without doing something drastic). Finally, I didn’t attempt to equalise the weight of the bikes, since I’m not interested in purely their aerodynamics, rather the “complete package”, and on the flat the difference should be minimal anyway. However, note that the M5 CHR and Schlitter Encore both weighed in at a little over 10kg (22lbs ish) whereas my High Baron weighs more like 11.5 – 12kg in current form. All could be lightened but the High Baron will always be heavier. This, plus frame and cockpit stiffness, would show up in a bigger way on an actual cycle ride with hills, dropping the High Baron down the ranking. I believe (subject to a full dismantling and the weighing of individual parts) that the Encore can be made lighter than the M5 CHR. It would be nice If you can compare this bikes agains Cruzbike Vendetta. Dave: On your “Speed vs. power” graph, should the red “250 watt” line be about 86% of the blue “200 watt” line? Matěj – I’m definitely up for the comparison, but we’d need to find a Vendetta somewhere! I feel groups of bars would make more sense than lines in the charts, as there’s not a clearly increasing linear x axis measure. Other than that, it looks an interesting test. @Dave: I would lend you mine but Prague is little bit far from Edinburgh.